DENVER – January 31, 2019 (TSX: IMP) (ITMSF:BB) – Intermap Technologies today announced preliminary unaudited financial results for the year ended December 31, 2018. In addition, as described further below, the Company announced a process to evaluate its strategic alternatives. For the year ended December 31, 2018, the Company reported revenue of $15.8 million, compared with $19.3 million and $7.0 million for 2017 and 2016, respectively. While revenue from software and data solutions products increased significantly in 2018, the increases were not enough to offset the impact of a delay caused by an election at a single foreign government customer, impacting our acquisition services revenue. As a result, the Company completed no foreign government data acquisition in 2018. 2018 revenues reflect a favorable shift in business mix towards shorter sales cycle, and higher-margin, software and data solutions sales, which grew 61% to $7.1 million. Excluding corporate costs, these business segments generated operating income of 58% and 61% of sales, respectively, during 2018. Although the Company’s data acquisition pipeline grew significantly in 2018, from a base of nil, this pipeline has historically required at least 30 months before converting to revenue. Improving the diversity of government revenue sources, including upgrading our processing engine to ingest multi-source data, and mitigating the impact of any future project delays, has been a key focus of recent management restructuring, R&D and sales force investment. Preliminary results from these efforts, which have already contributed positively to our sales pipeline, include the Company’s recent selection by the National Geospatial-Intelligence Agency (NGA, the world’s largest geospatial customer), as a member of the CACI International Inc. team (Team CACI), to participate in NGA’s Janus Geography contract, as previously reported on July 12, 2018. Adjusted EBITDA for 2018 was $3.0 million, compared with $3.5 million and negative $7.2 million in 2017 and 2016, respectively. The decline in Adjusted EBITDA for 2018 was related to carrying costs associated with the foreign government data acquisition customer, offset by improving operating leverage and a favorable shift in revenue mix, as described above. Excluding non-operating corporate costs, each of the Company’s three business segments earned positive Adjusted EBITDA in 2018. 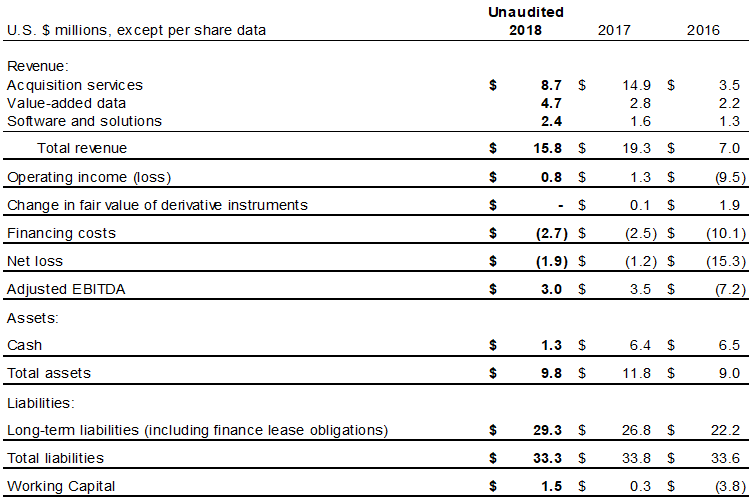 Software and data solutions contributed more than half of the Company’s Adjusted EBITDA for the first time in its history. Adjusted EBITDA is not a recognized performance measure under IFRS and does not have a standardized meaning prescribed by IFRS. The term EBITDA consists of net income (loss) and excludes interest, taxes, depreciation, and amortization. Adjusted EBITDA is included as a supplemental disclosure because management believes that such measurement provides a better assessment of the Company’s operations on a continuing basis by eliminating certain non-cash charges and charges that are nonrecurring. The most directly comparable measure to adjusted EBITDA calculated in accordance with IFRS is net loss. A reconciliation of net loss to Adjusted EBITDA is provided in the table below. The Company continues to absorb high corporate level costs relative to its small size. These costs are related to its current capital structure, legal, accounting, public company compliance, tax, consulting, and corporate facilities. Reflecting this scalability, corporate costs have been reduced by more than 60% as a percentage of revenue since 2016, and further reducing corporate costs in conjunction with revenue and pipeline, without harming business opportunities, continues to be an important operating focus. Working capital improved to $1.5 million in 2018, compared with $0.3 million in 2017, and negative $3.8 million in 2016. The Company’s significant improvement in working capital was offset by a decline in general purpose liquidity. As of December 31, 2018, cash totaled $1.3 million. During 2018, the Company invested $1.2 million to upgrade its asset base, including obtaining three patents, building its NEXTMap One global terrain model, developing its IRIS data enrichment process, re-constituting its Federal Services Department of Defense business, authoring over 94 terabytes of data to its new cloud architecture, and upgrading InsitePro software. In addition, the Company is in the process of adding 1.6 petabytes of 1-meter posted digital surface and terrain models to its cloud architecture, which will be completed over the next few months. Commercial products drawing on these technologies and intellectual property service the insurance, aviation, telecommunications, government, and defense industries. During the year, the Company added over 17.8 million square kilometers of high-resolution terrain models to its proprietary NEXTMap data archive. It announced a new certified data product in partnership with Lufthansa Systems that will dramatically improve commercial and government aviation safety and efficiency. The Company also added to its sales efforts targeting admitted insurance carriers and flood insurance providers, and now counts several dozen large global insurance companies and their affiliates among its InsitePro (US) and Aquarius (Europe) customer base. Intermap Technologies has announced a process to explore strategic alternatives. Such strategic alternatives could include, among other options, a sale of the Company, a business combination, or continuing as a standalone entity. The Company has retained Teneo Capital as their financial advisor and Quilty Analytics as a strategic consultant to assist the Company in evaluating its alternatives and prudently determining the optimal course of action for the Company. The Board of Directors has been informed by Vertex One Asset Management (“Vertex”), the Company’s only first lien secured creditor and its largest shareholder, of its general preference for liquidity at this time. Vertex has provided financial support to Intermap for the past six years. The Company derives most of its revenues from government contracting, characterized by long sales cycles, changing political priorities, evolving government requirements, large well-funded competitors, and uncertain pursuit costs. To qualify for projects, it is critical that the Company is adequately capitalized, or is supported by a committed and well-capitalized investor. There can be no assurance that the consideration of strategic alternatives will result in the completion of any transaction or any other alternative to replace the financial support provided by Vertex. The Company has not set a timetable for completion of the review process, and it does not intend to comment further unless a specific transaction or alternative is approved by the Board of Directors, the review process is concluded, or it is otherwise determined that other disclosure is appropriate. The Company’s common shares have traded below the minimum levels required to maintain a market capitalization and public float of $3 million and $2 million, respectively over the past 29 consecutive days. As a result, it is possible that the Company may become subject to remedial listing review by the Toronto Stock Exchange (TSX). If the Company becomes subject to a remedial listing review, it will have an opportunity to resolve the deficiencies that led to such review. Headquartered in Denver, Colorado, Intermap (TSX: IMP) (ITMSF: BB) is an industry leader in geospatial intelligence solutions. These geospatial solutions can be used in a wide range of applications including, but not limited to, location-based information, risk assessment, geographic information systems, engineering, utilities, global positioning systems maps, oil and gas, renewable energy, hydrology, environmental planning, land management, wireless communications, transportation, advertising, and 3D visualization. Intermap has three core sources of revenue: multi-sensor data acquisition and collection, enriched data products, and commercial applications, software and solutions. The Company is a world leader in data fusion, analytics, and orthorectification, and has decades of experience aggregating, enriching, and managing 3-D data derived from a number of different sensor technologies and data sources. For more information please visit www.intermap.com. Certain information provided in this news release, including statements in relation to the Company’s review of strategic alternatives, future business plans, product development and revenue-generating activities, and possible remedial listing review by the TSX constitutes forward-looking statements. The words "anticipate", "expect", "project", "estimate", "forecast", “will be” and similar expressions are intended to identify such forward-looking statements. Although Intermap believes that these statements are based on information and assumptions which are current, reasonable and complete, these statements are necessarily subject to a variety of known and unknown risks and uncertainties. Intermap’s forward-looking statements are subject to risks and uncertainties pertaining to, among other things, cash available to fund operations, availability of capital, revenue fluctuations, nature of government contracts, economic conditions, loss of key customers, retention and availability of executive talent, competing technologies, common share price volatility, loss of proprietary information, software functionality, internet and system infrastructure functionality, information technology security, breakdown of strategic alliances, and international and political considerations, as well as those risks and uncertainties discussed Intermap’s Annual Information Form and other securities filings. While the Company makes these forward-looking statements in good faith, should one or more of these risks or uncertainties materialize, or should underlying assumptions prove incorrect, actual results may vary significantly from those expected. Accordingly, no assurances can be given that any of the events anticipated by the forward-looking statements will transpire or occur, or if any of them do so, what benefits that the Company will derive therefrom. All subsequent forward-looking statements, whether written or oral, attributable to Intermap or persons acting on its behalf are expressly qualified in their entirety by these cautionary statements. The forward-looking statements contained in this news release are made as at the date of this news release and the Company does not undertake any obligation to update publicly or to revise any of the forward-looking statements made herein, whether as a result of new information, future events or otherwise, except as may be required by applicable securities law.